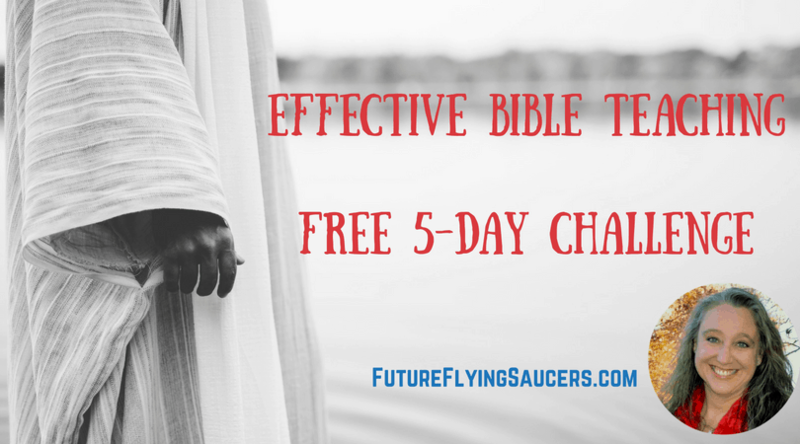 Effective Bible Teaching Facebook Challenge | FutureFlyingSaucers. Are you ready to make your Bible Teaching effective, meaningful, and exciting? The Becoming an Effective Bible Teacher Challenge is about transforming insecure, deflated Bible lessons into vibrant, engaging spiritual discussions with children. Every day, for 5 days, you will be sent a lesson that should take no more than 15 minutes to complete. With each lesson, you will receive a homework assignment to complete and share in a closed Facebook Group. In that group I will meet with you through Facebook LIVE to discuss the lesson and share more information. you want to teach the Bible so that you and the children have an enjoyable time. you want to keep kids motivated to learn the Bible. you do not even know how to start teaching the Bible to kids. you want to learn how to make the Bible applicable to children. you want to learn how to grab the attention of a group of children. you want to challenge older students and teach younger students at the same time. you want to know how to organize Bible lessons. you want to convey that the Bible is more than just a story. you have had years of seminary training and experience with children and don’t want to innovate. you are not ready to teach the Bible seriously so kids can learn. you want to babysit children at church. you are not willing share your teaching skills with children or youth. you want quick results without putting in the time. A reminder of the importance of Bible Teaching. Why YOU are so important to the church. A list of the Hindrances of effective Bible Teaching. How to Assess your Bible Teaching. Practical Bible Teaching tips you can implement right away. How to improve yourself so you can be a better Bible Teacher.